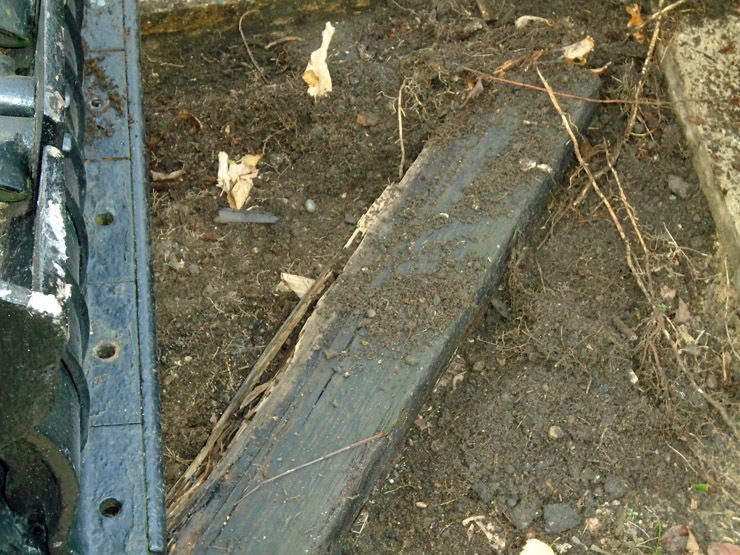 One works matter needing attention were rotten timbers that were supposed to be supporting the Midland Railway ground frame but were not doing a good job. 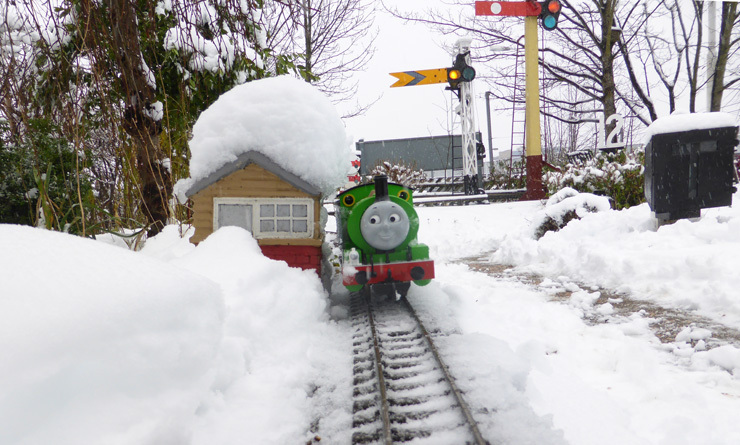 Garden Railway: With observations that the increase in visitors may be due to this attracting back families with young children, the decision was taken to make it double-tracked so that both James and Percy can be run together. So our resident Civil Engineer got to work. Work continued into 2018 - see that News page for the final result. The only open afternoon on November 12 saw a surprising 93 visitors turn up. 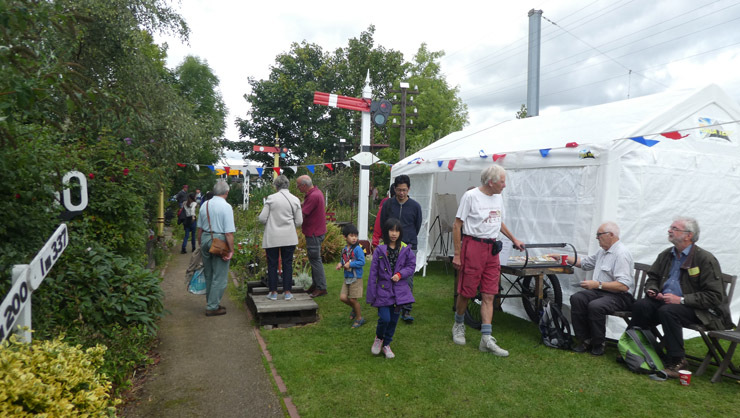 Plans were laid for various works outdoors and indoors with a month to go until our next open afternoon. 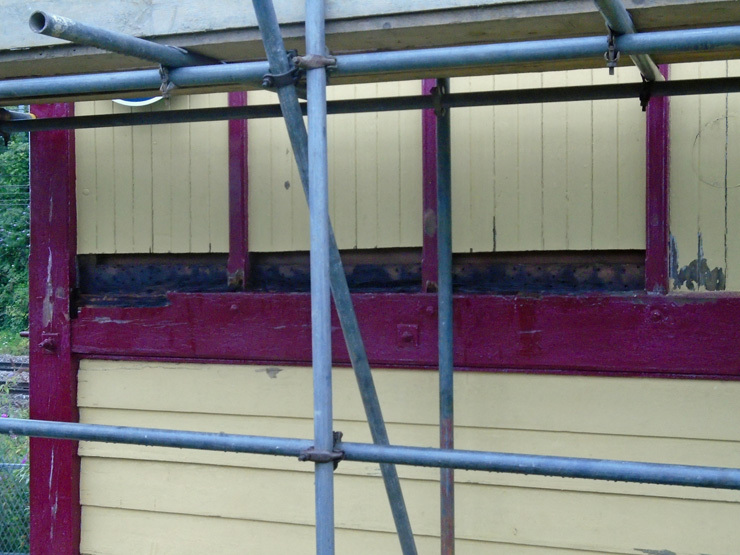 The garden shed was given a fresh coat of preservative. Indoors a second pair of block bells was wired up in anticipation of taking them to an exhibition in January 2018. 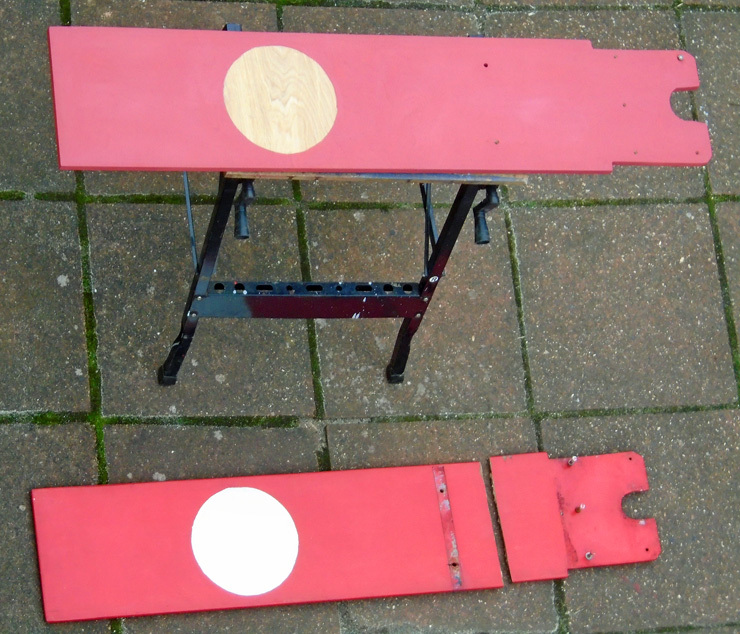 Midland Railway "Pegger" and "Non-pegger" block instruments were cleaned up and connected together to make a further interactive display. 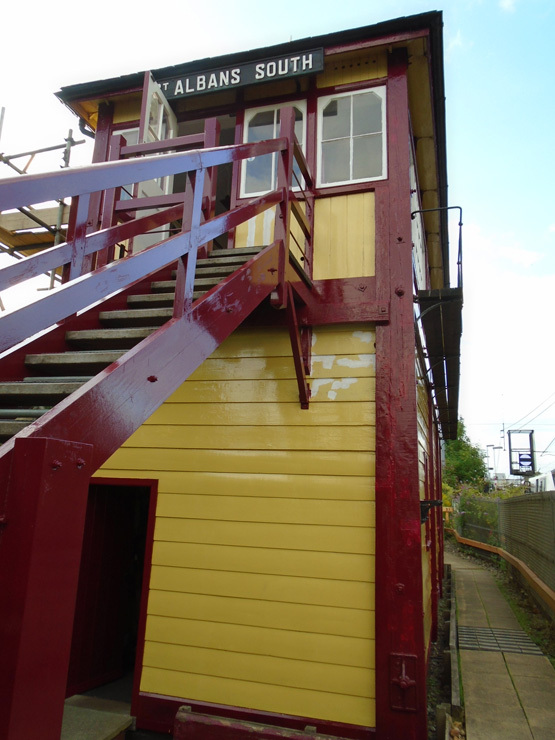 More work took place on improving the detection of lever positions on the frame - particularly the levers that still have downrods connected to them. 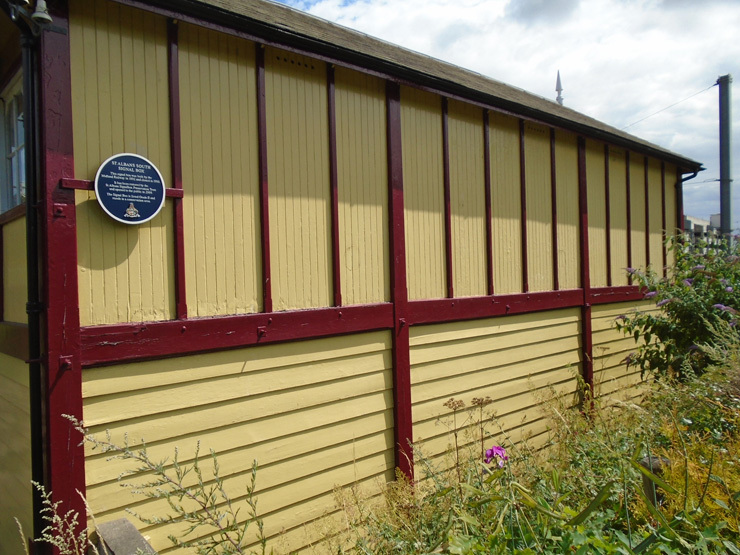 We have been liaising with Elstree and Borehamwood Museum over the loan of some items to them for an exhibition they are holding from late January to late July 2018 to commemorate the arrival of the the railway in 1868 - see the News 2018 page for more details - so several other items have been worked on as well. The last open afternoon of October saw a new record set for the number of visitors on a regular Sunday afternoon - no less than 103, beating the previous best on the 23rd of July by 1! The end of October also saw the last bit of the outer face of the boundary fence finished off. 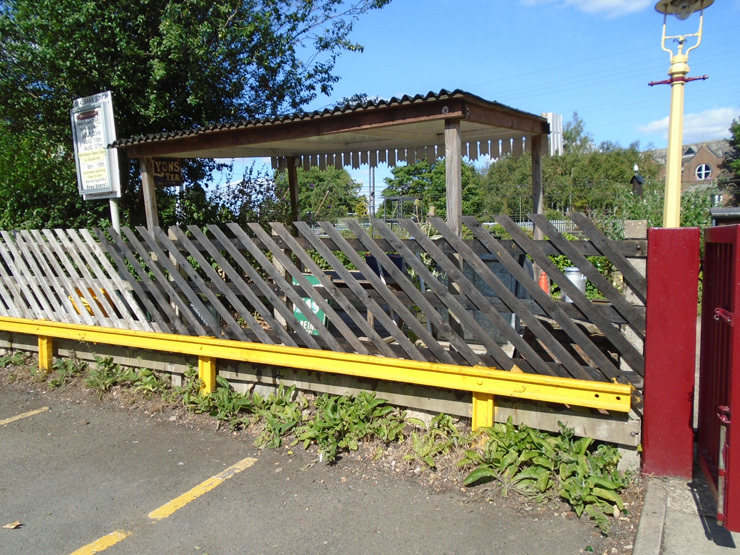 We mentioned below in July about starting to apply preservative to the Midland Railway style boundary fence. 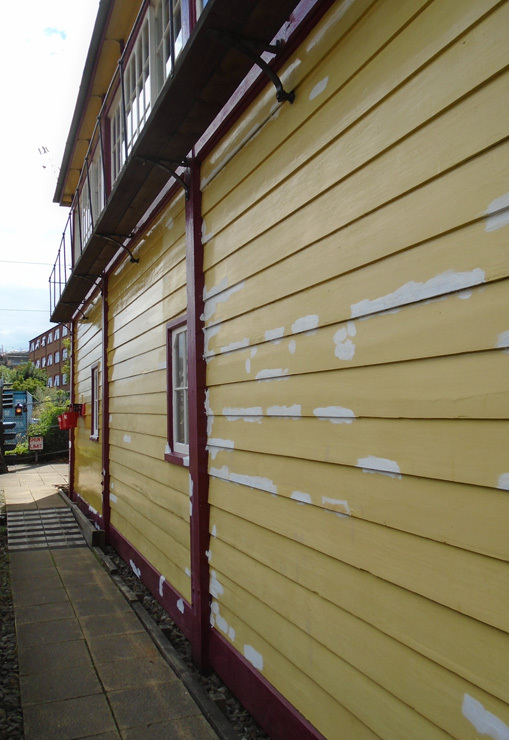 We started off by using a brush, with which we did the first bit by the Tea-serving Shelter. The result was OK but took time and was heavy on the wrists. We ended up with things in the first photo below. Investigation showed we could get a cheap portable sprayer powered by an inbuilt manual pump, after which progress was a lot quicker and less wearing on the wrists. The remaining photos show progress along the fence. We hasten to add that sheets of plywood were placed immediately behind the fence where we were spraying to prevent overspray onto the plants behind! 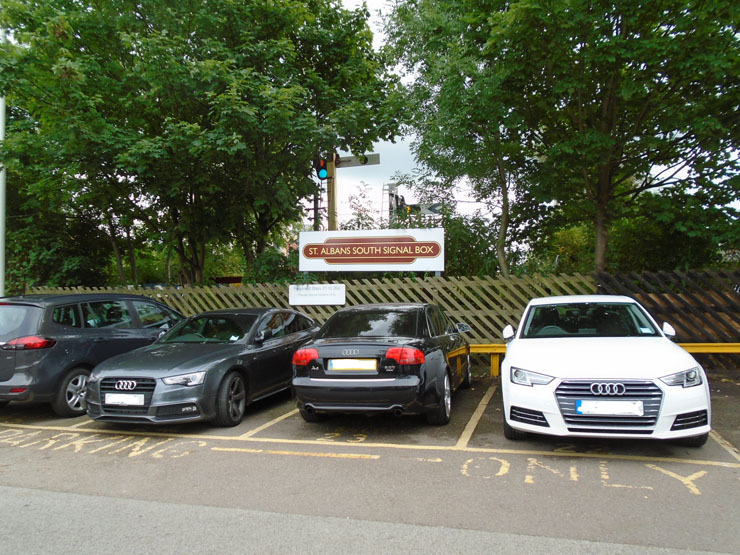 We could only work at weekends to avoid parked cars and in dry, not too windy weather, so it took until late October to complete the work. 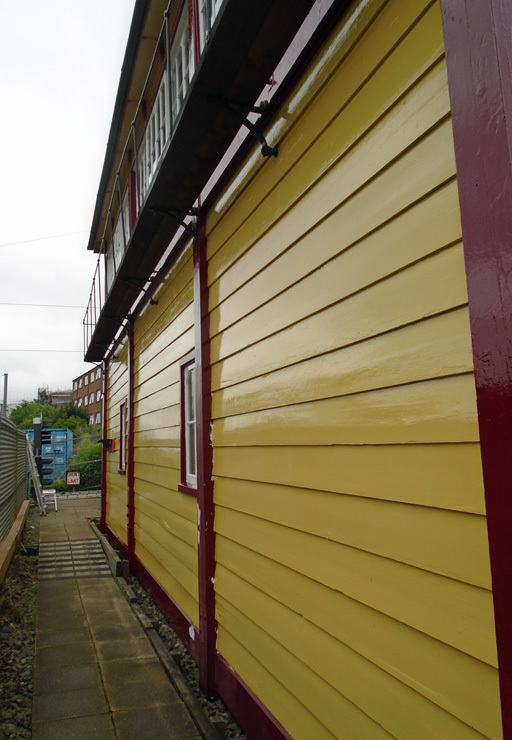 The garden shed, seen to the right of the third picture, has also had a fresh coat of preservative. 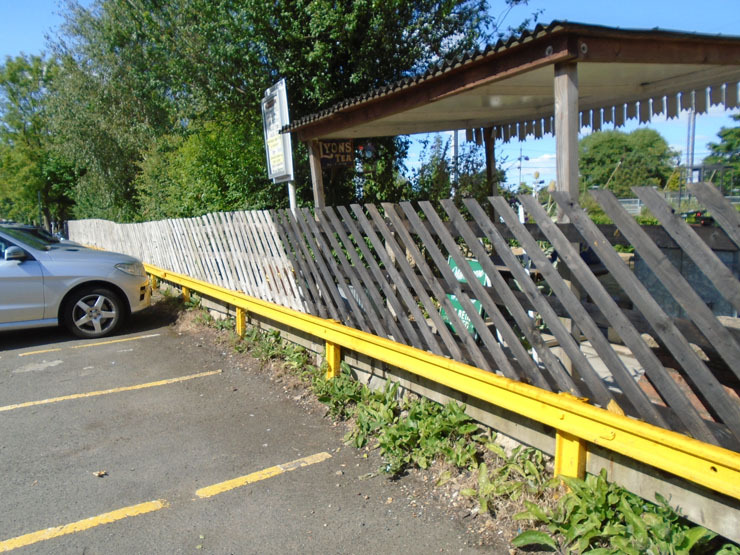 The fence at the end of our two car parking spaces (fourth picture) will be done in 2018 when the plants growing there have been trimmed back. 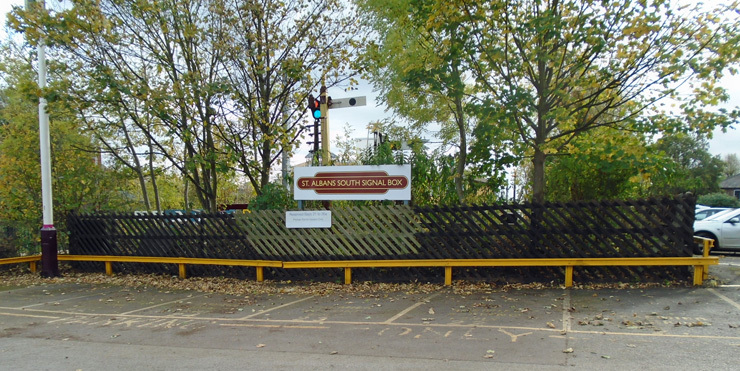 The next shows not only the partly represerved north end fence but our new sign erected there in August. Finally by mid-October we had nearly done the north end fence. The inside of the fence will be done in 2018 after the annual hedge trim has taken place to allow access! 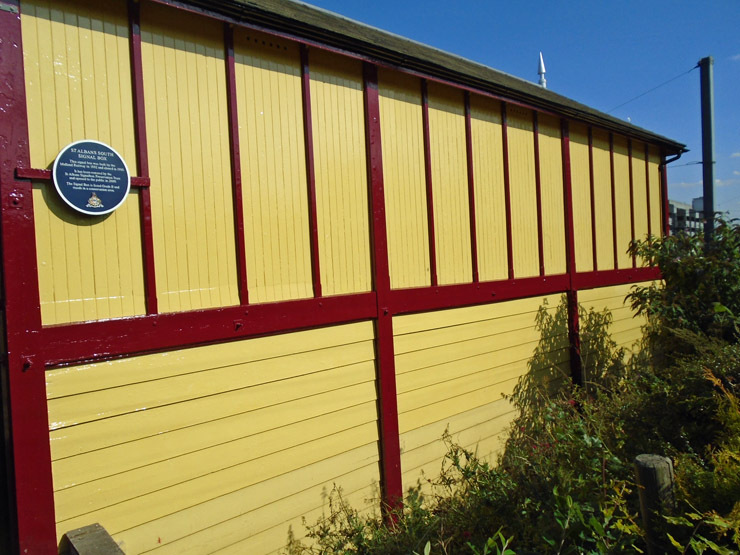 The box has undergone a complete repaint of the exterior; it started in late July and ended in early September and was undertaken by a professional painter. 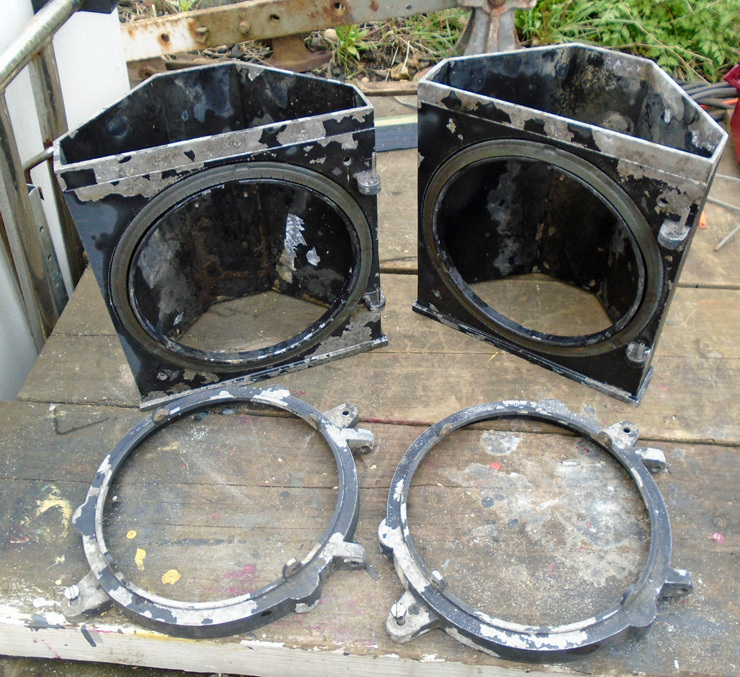 The following photos give some idea of the work undertaken and the one major problem that was found during the works. Top row are photos taken before or during the works. 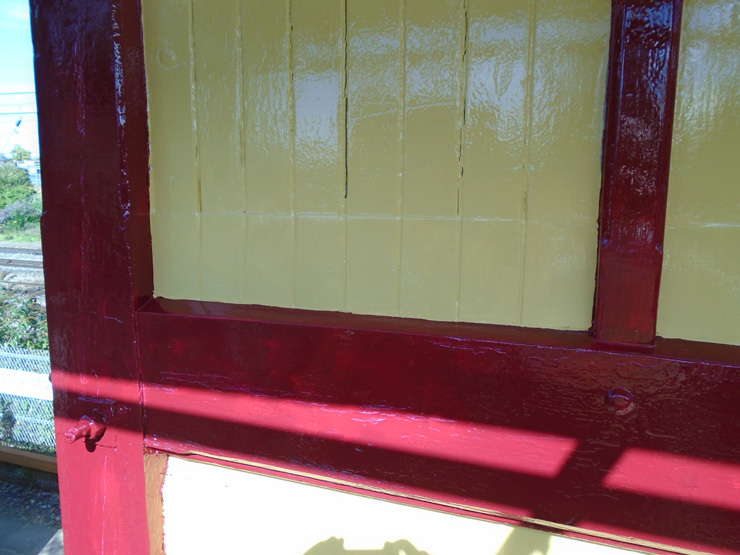 The second row shows the box after completion of the painting --------------------- and the repaired woodwork. 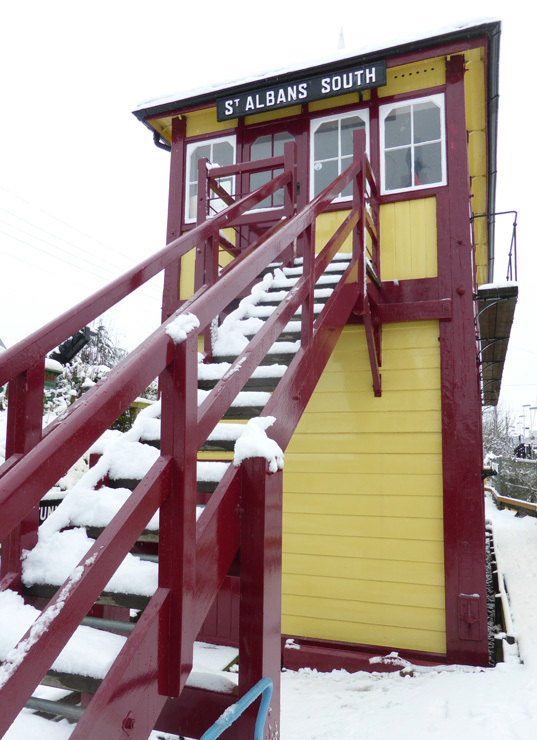 John Finnemore, who lives 'up' the line in Kentish Town, visited our signal box some time ago and was inspired to write "Wroxton Box". (He is most known for the comedy series “Cabin Pressure” on Radio 4.) 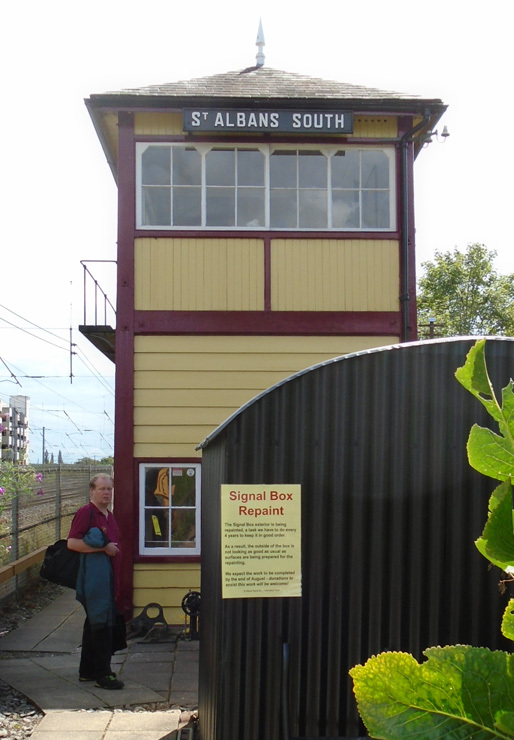 Arrangements were made for the production company to record bells and signalling sequence at St Albans South; these were broadcast as part of the programme in the “Double Acts” series. It was broadcast on Radio 4 on Wed 12th July 18:30, and was 30 mins long. 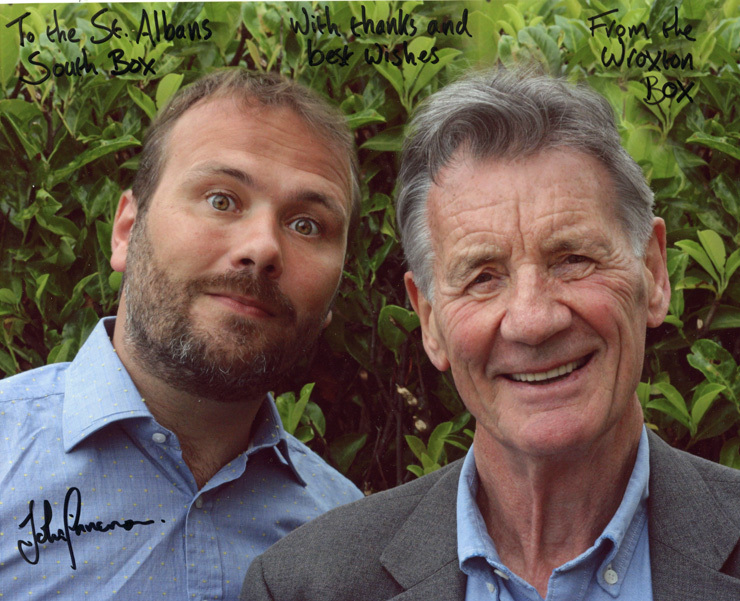 John Finnemore played one character with Michael Palin playing the other. 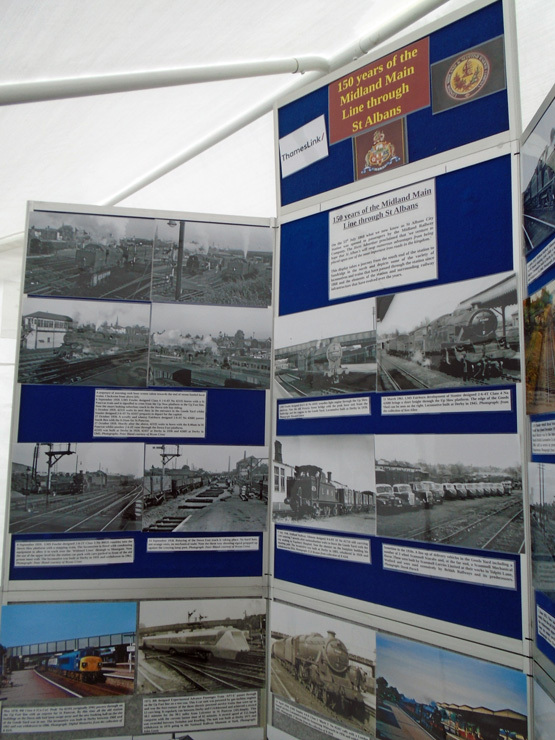 John came on our recent Heritage Open Day with the photo below (no need to click on it!). We were able to thank him for his support by including the box in the production and also our appreciation of the play and his comedy work. Further attendence at a local event occured over the weekend of the 15th/16th July when we went to the Highfield Park Town and Country Fair. We were right by the main entrance of the site, and were able to greet all the visitors as they came in. 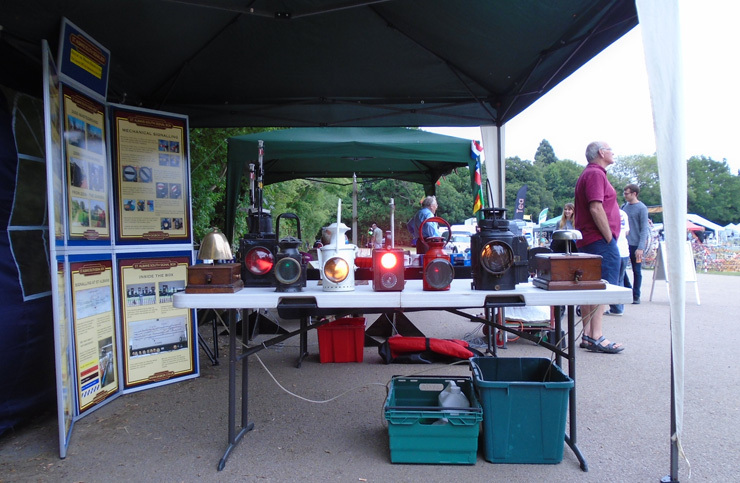 (Photo 1) and show them our small lever frame and model signals, as well as a sample of the lamps we have displayed at the box (Photo 2). We took some 700+ leaflets and came back with just one! 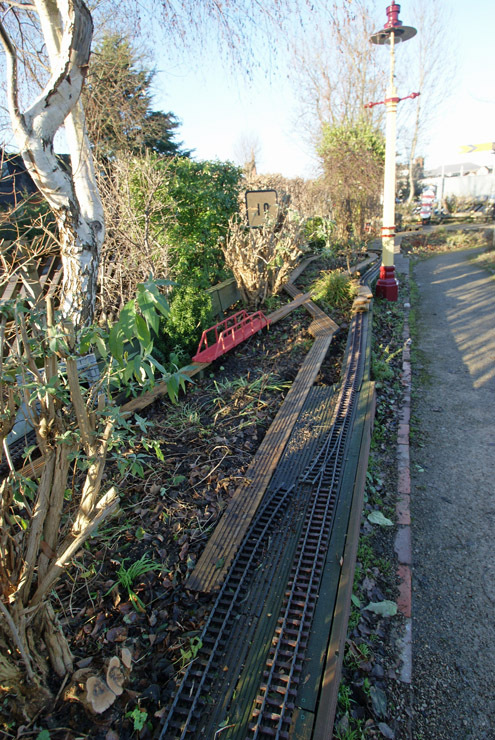 Back at the signal box site, a start has been made on represerving the site fence (Photo 3). 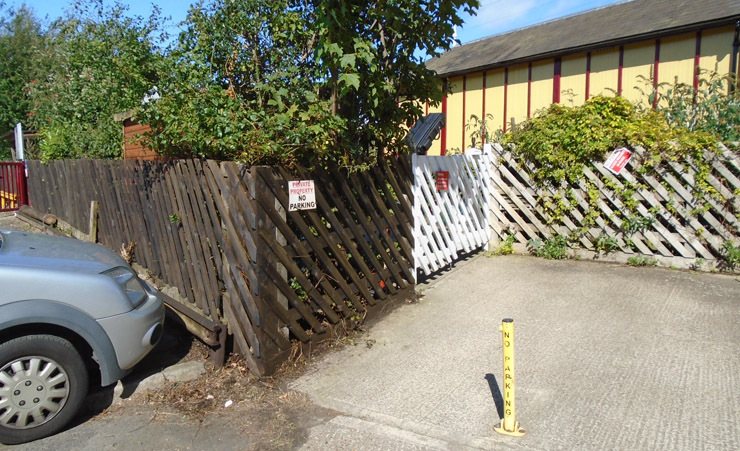 As part of this fence work, the "Next Open Days" notice board, on the left of Photo 3, has been moved to by the entrance gate and lowered; this removes it from the proximity of one of the hedge trees, lowers it and makes it more readable (Photo 4). 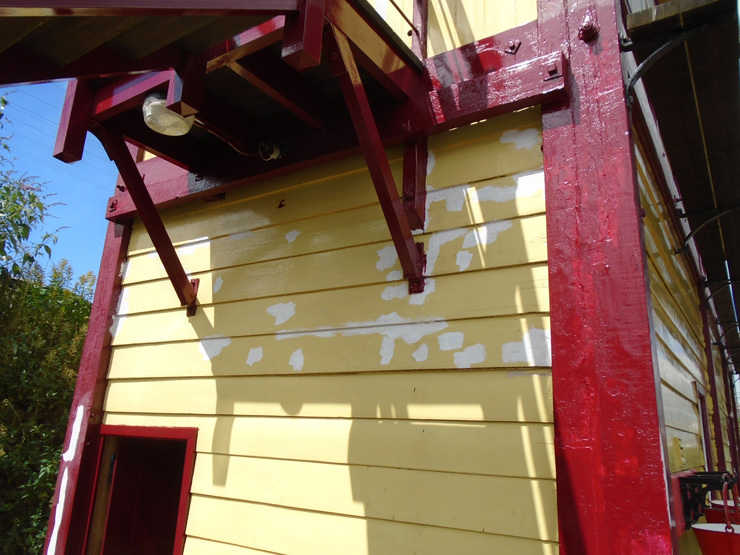 Work has also started on our second major repaint of the outside of the signal box, by a professional painter. We'll report on progress as it takes place. 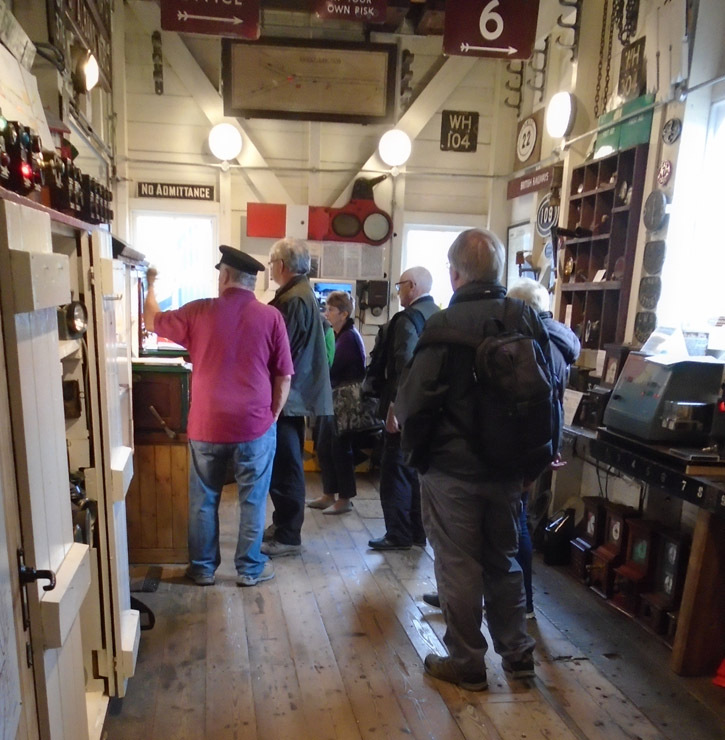 A new Sunday afternoon attendence record was set on the 23rd of July when 102 visitors arrived to keep us busy - possibly due to the leaflets given out at the Town and Country Fair the previous weekend? 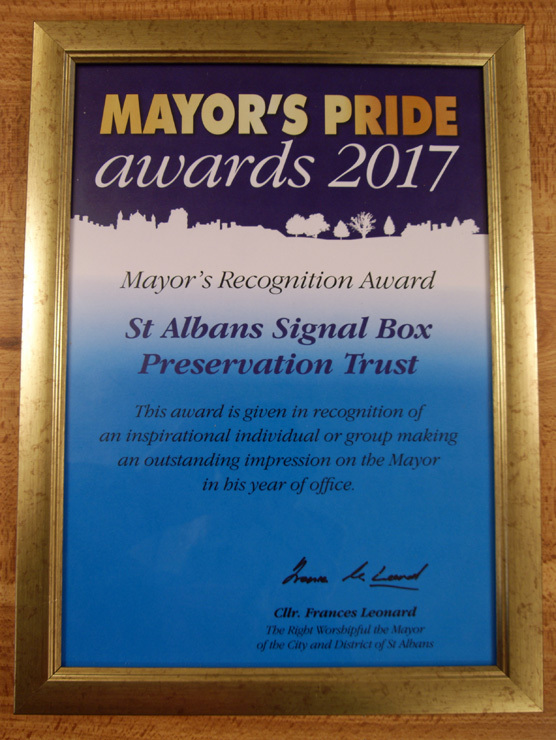 A considerable flurry of activity at the start of June with attendence over three days at two local events in St. Albans. 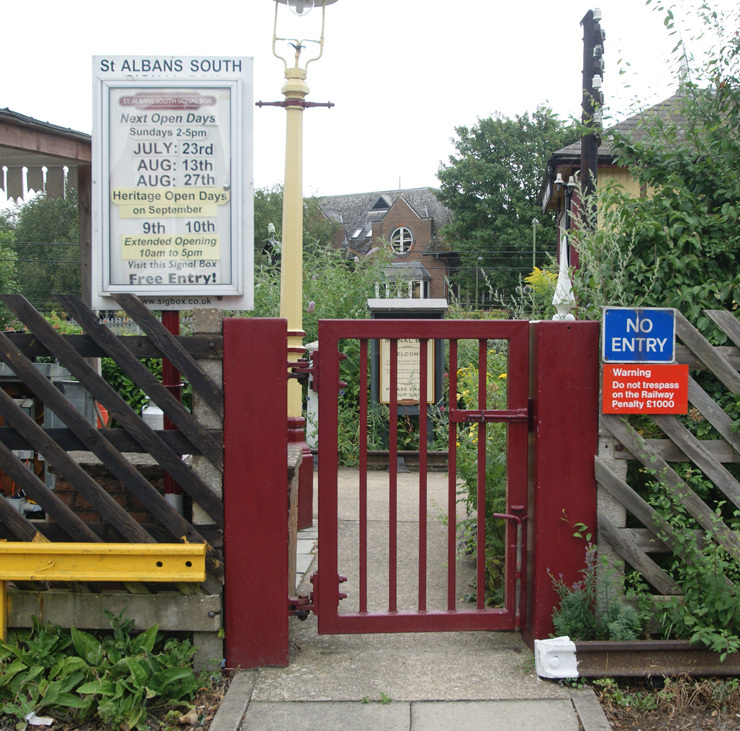 On Friday 2nd June we were invited to attend a 'Family Day' at St Albans Abbey station, a new initiative by the Community Rail people involved with the line. We took along our publicity stand, some sales items and exhibits (top picture), and were entertained at intervals by a small band (centre picture). Good publicity and modest sales resulted. 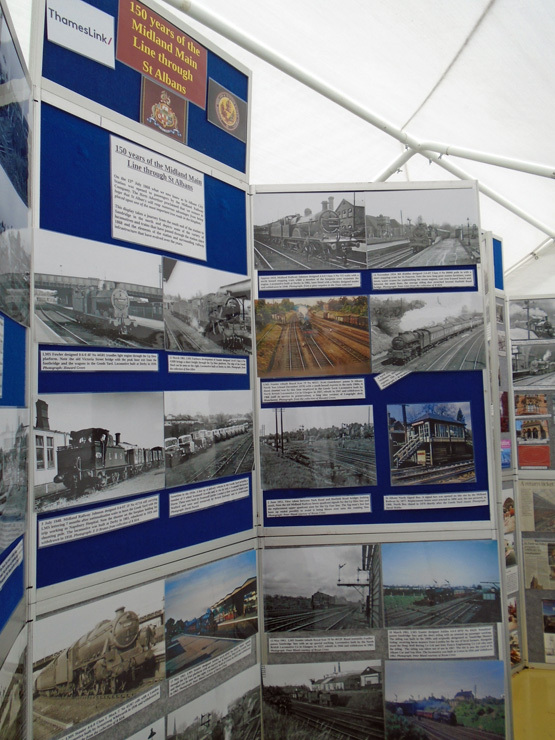 We literally went straight from the Abbey station to the Oaklands College site between St Albans and Hatfield to set up a much extended display in our large marquee for the two days of the St Albans Steam Fair on the 3rd and 4th of June. 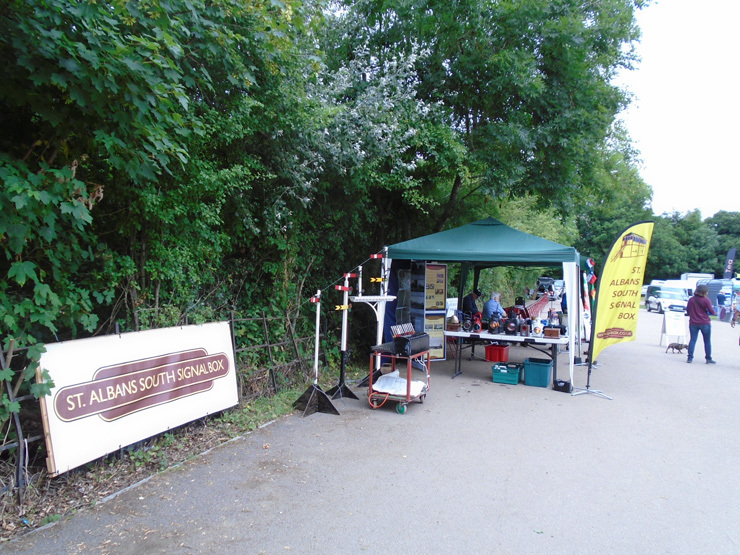 The bottom picture shows our stand, together with our friends from the North London Society of Model Engineers nearby, as usual. A brief round-up of April and May's happenings. For the English Tourists' Board "Big Weekend" on the 1st/2nd April, our extended opening saw 370 visitors in total. Access was complicated by a water leak in the carpark (middle picture) which turned out to be the feed pipe to our own site! (lower picture). The normal open afternoons during April and May saw around 60 visitors each afternoon, continuing a trend in 2017 of significantly higher visitor numbers than last year. 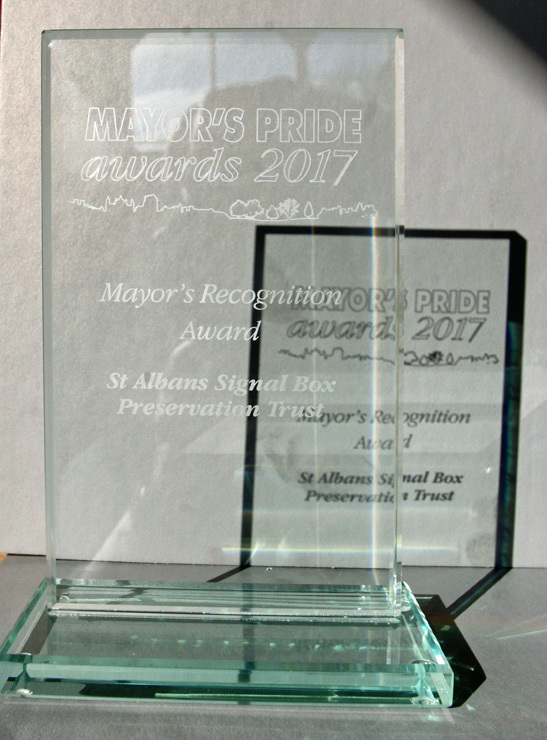 The Trust received an invitation from the Mayor of St Albans to attend the "Mayor's Pride Awards" dinner at St Michael's Manor hotel on Tuesday March 28th. We weren't told why we were being asked, but the invitation was for eight people. 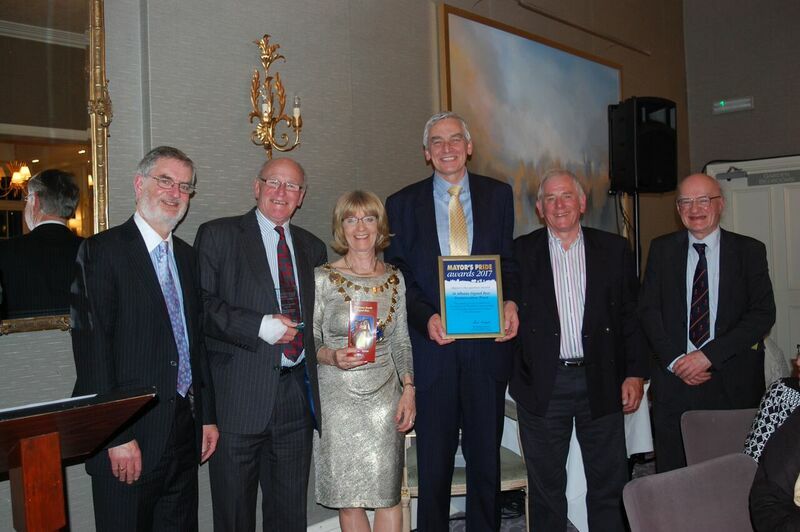 Eight other people or groups received their awards before we were called up to be given the Mayor's personal 'Recognition Award' for the group which had made the most impression on her during her year in office - photo (a). We were presented with a engraved glass trophy - photo (b) - and a certificate - photo (c) - which are now on display in the box. Our Chairman, Tony Furse, took the opportunity to publicise the 'Big Weekend' open days at the end of the week, and was later interviewed by Radio Verulam - photo (d). 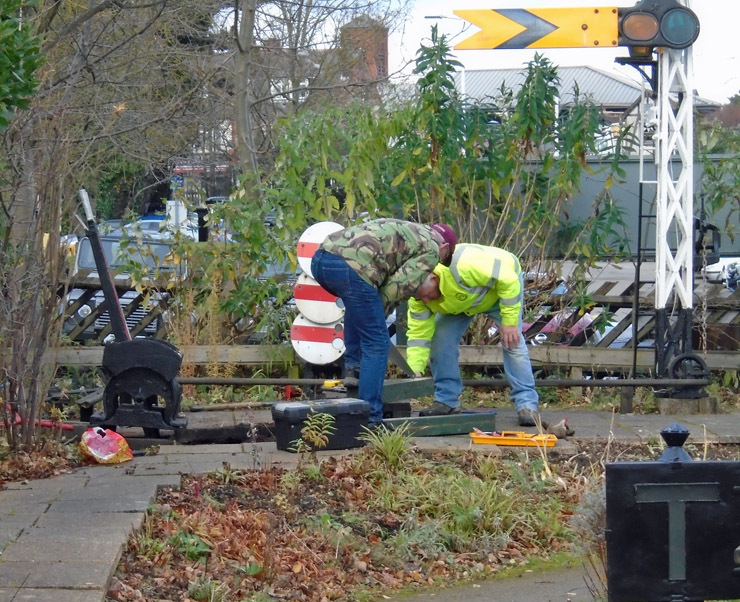 Repairing the damage from 'Doris' - the item below showed the start of work on the replacement arm for our Midland Railway signal. The two photos on the right show the new arm in place and the switch operated by the arm being put back. March - what a blow! Well, the blow was actually in February, but we literally were left to pick up the pieces after Doris had passed by. Attending in daylight on Tuesday 28th Feb to show a party of visitors round, we found our one wooden signal arm had broken off, so on the 1st March, our working party day, the remains were recovered. A close look at the arm, made several years ago by ourselves from a piece of 3-ply timber, revealed that the timber had been split for a while through two of the three plys - note the dirty two plys against the one fresh break in the middle photo. By the late afternoon, the replacement arm had been cut to shape and given its first undercoat. It is made from a rather thicker piece of wood! 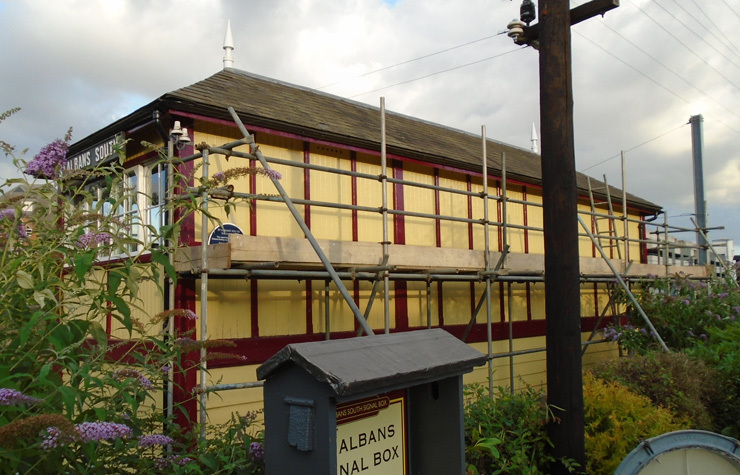 But some good news - In November last year we resealed and repainted the roof finials of the box - even in the downpours associated with 'Doris' not a drop reached the upstairs floor! 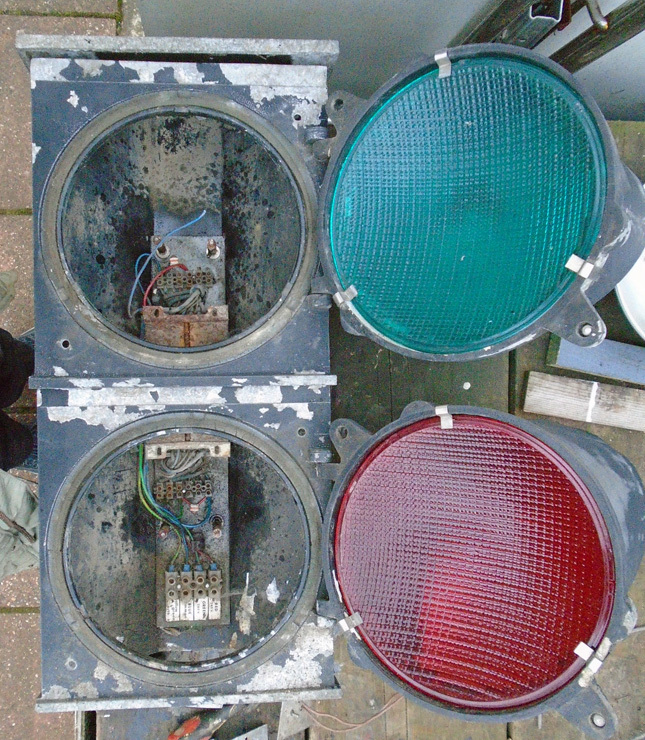 Some while back we were given a quantity of bits and pieces, one of which was apparently a two-aspect stop signal. Recent investigation has shown that it was actually a traffic light signal - internal circuits suggest it had been used to control entrance/exit through a narrow gateway or other restricted passage. 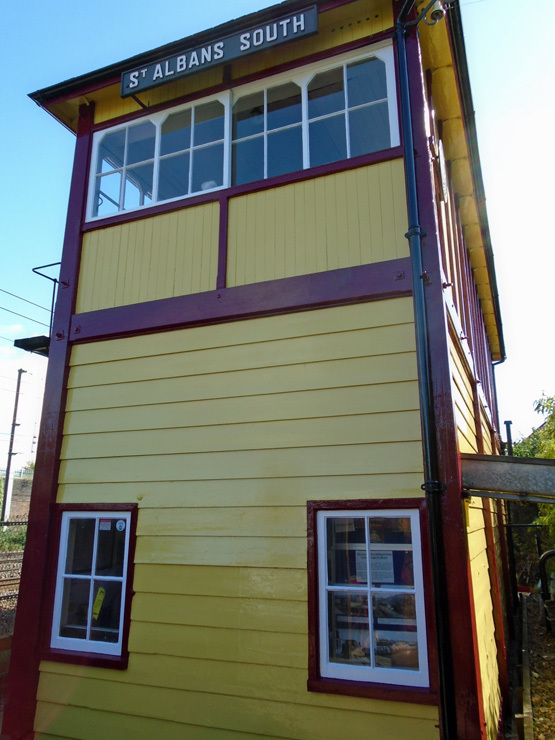 We decided it could be converted into a two-aspect signal to form a working demonstration with our two train dispatching indicators acquired last year. In 2016 we mentioned problems with animals invading part of our cable ducts. Checking more of the ductwork at the North end of the garden we found further traces of animal life. 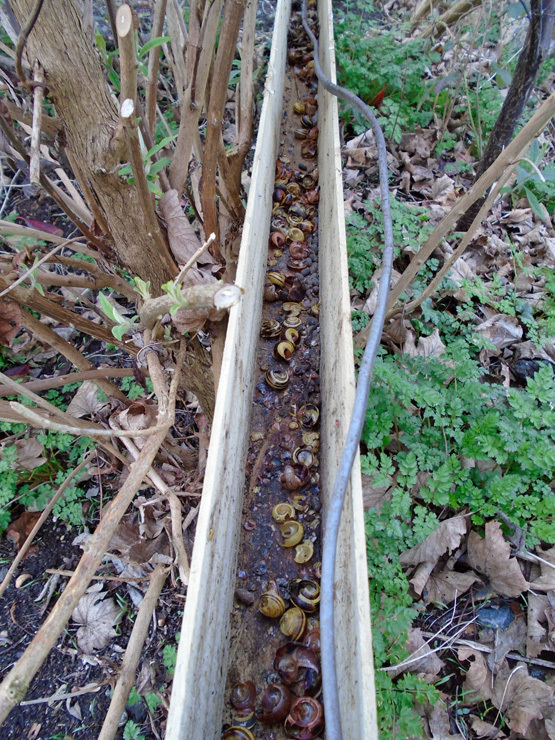 One section had dozens of empty snail shells in it. Fortunately the cable running through the duct is a large one and wasn't chewed! January off to a good start! 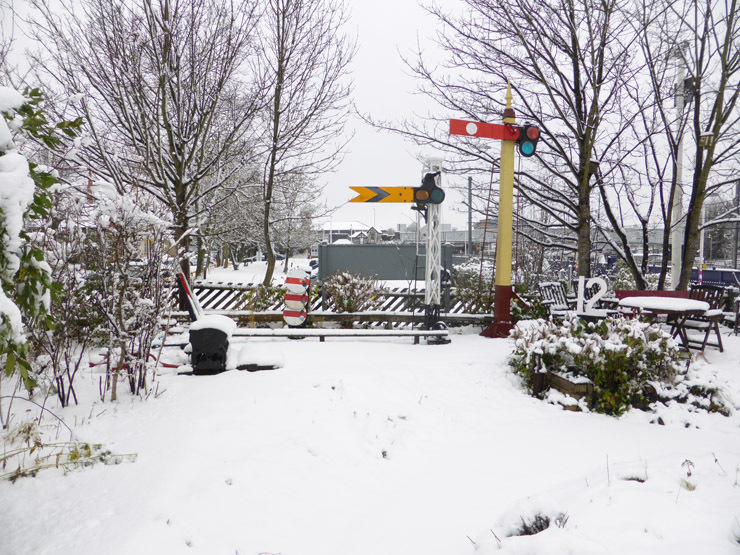 The first Open Afternoon of 2017 saw 66 visitors to the box during the afternoon - and the sale of a couple of the spare signals left over from the LED signals we got and installed during 2016. The number of visitors on our only Open Afternoon in this January is heartening, and it seems mostly due to our President's 30-second plug on Three Counties Radio the previous day! The following weekend (14th/15th) we were at the resited Chiltern Model Railway Show at Stevenage Leisure Centre. We were in one of the two main halls used by the exhibition alongside other stands, with more room and no longer on our own by the exit. 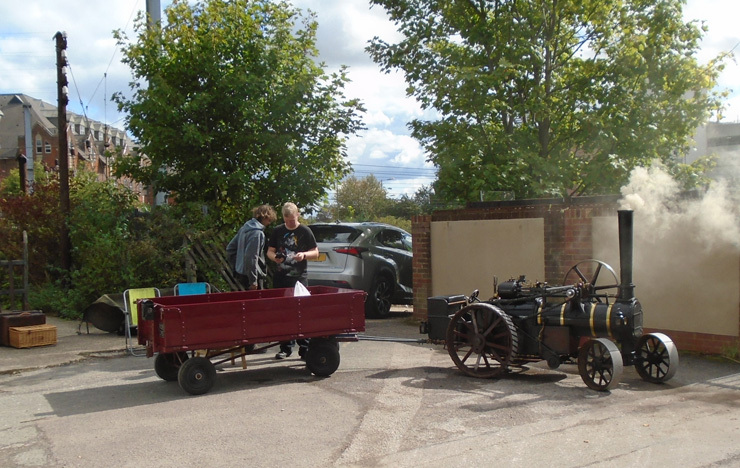 Sales of books, wagons and other items totaled well over £300 to add to our funds. In addition many leaflets were given out and hopefully new contacts made. Thanks are due to the CMRA for letting us attend and to those members who helped on the stand for their efforts.